On Wednesday the Greek parliament approved austerity measures to avoid default. Lawmakers in Athens on Thursday approved implementation of the plan insisted upon by European officials. With this economic backdrop, the general market sentiments have improved across the world. The recent US economic figures have also shown stability and slight improvements. These have encouraged the sideliners to be back into the market and be ready for quick bargain hunting. Mentioned in my earlier posts, Straits Times Index STI has rebounded from lower support at 3000 and now it is on its journey to retest the upper consolidation resistance at 3150 before any mid term stock market recovery is fruitful. The indicators are comforting with a significant rise in trading volume above month average, MACD has u-turned and cleared into positive zone. RSI & STO has begun uptrend from earlier bullish divergence and OBV is till at good levels indicating good funds activity. The other strong evidence of possible sustained recovery is the consistent recovery in most of the STI component stocks based on 5 days price change. 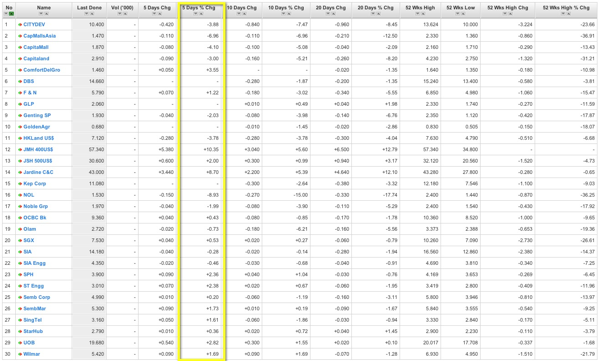 One final sector which currently lags is the property and REIT component stocks. As of yesterday, the key US economic indicator – ISM Chicago gauge tallied a June rebound to 61.1 from 56.6 in May, bolstered by a rise in new orders and lifting the Dow into positive territory for the second quarter of 2011. 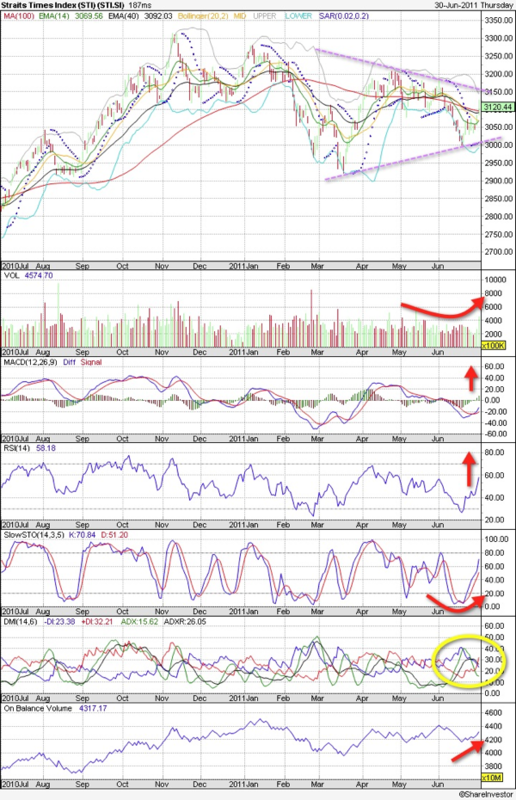 Hopefully, this will add positive trading momentum to aid the testing of resistance at 3150 – 3200.